Up fairly early, we had got cleaned up and had a lackluster continental breakfast. After breakfast, we walked about half a mile to the Vermont State House. 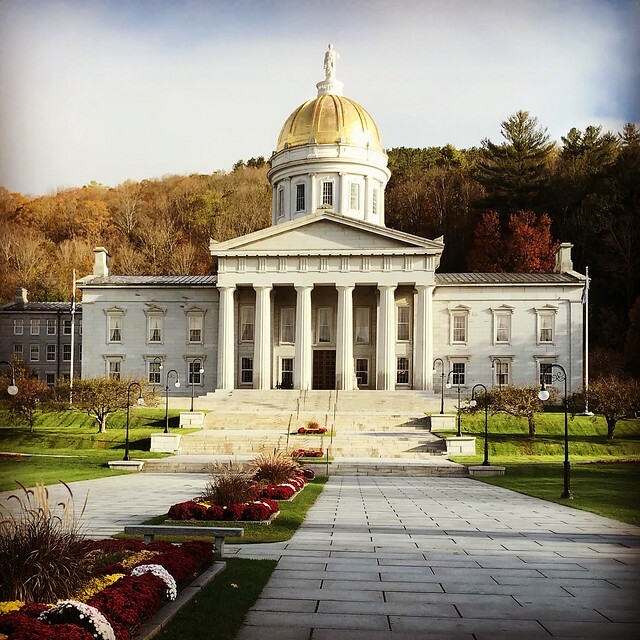 With a population of only slightly more than 7,000, Montpelier is the smallest state capital. The building exceeded my expectations; I enjoy the intersection of architecture, history and geography. We rolled from the Inn about 9:45 am. We are heading east to New Hampshire. After some debate, we made a stop at the Cabot Creamery. We watched a short video, did a tour of the cheese plant and tasted a wide variety of cheese. We also stopped very briefly at the Goodrich Maple Farm. We got to the Omni Mount Washington Hotel about 12:45 pm and were in the room by 1:00 pm. The view of Mount Washington and and the surrounding area is spectacular. We had lunch in the hotel at the Rosebrook Bar (chowder, chicken sandwich and crab roll). The view from our table was amazing. After exploring the property for a while, we did a 50 minute history tour of the hotel; there was just Sharon and I plus one other person with the docent. We crashed in the room for awhile. Eventually, I took my book down, sat on the verdana and watched the sun go down. We finished the night with a late dinner in the main dining room. We started with Tasso Ham and Crab Stuffed Oysters. We spilt a Signature Caesar salad. For entrees, Sharon had Maple Braised Beef Short Rib (Pappardelle Pasta, Roasted Mixed Mushrooms, Asparagus, Tomatoes, Spinach, Mozzarella Pearls, Toasted Pine Nuts, Red Wine Veal Reduction) and I had Georges Bank Scallops (Green Pea Purée, Artichoke Rice Cakes, Peppers, Spinach, Mango Pineapple Cipollini Relish, Cashew Crumbs). We walked through the Cave speakeasy before crashing for the night. With this dinner, we celebrated our 21st wedding anniversary. This year, we picked out some presents ahead of time. Sharon got some David Yurman earrings to match the bracelet that I got her last year, while I got two Apple Watch bands.